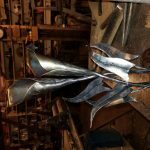 I recently finished a six day blacksmith class from well known school. I decideded at last minute to take a two day class with Steve to increase my skill level. What a difference! I can unequivocaly say I learned more from Steve in two days than I did at the previous school in six. His shop is organized and his teaching skills are excellent. In addition he is patient, flexible and encouraging. And a real nice guy as well I plan on going back with my grandson.